When it comes to a vehicle's electrical system, the central component responsible for ensuring electrical function is the alternator. The alternator maintains the working condition of the battery so that the vehicle will crank and start. Once the vehicle's engine has started, it is the alternator that produces the electrical power to both maintain the battery for the next start and provide enough power to run the various electrical circuits. These circuits include ignition, lighting, fuel injection, instrumentation, powertrain management and passenger comfort circuits such as audio, power windows, power seats, heating and air conditioning functions. When the alternator has failed, the battery does not get sufficient charge and the electrical demands of the vehicle's circuits are not met which results in vehicle performance issues. This can be the result of normal war and tear after 250,000 km. Alternator failure can also be the result of increased electrical demand due to added loads such as accessory lighting, larger and more powerful audio systems, or the addition of more batteries such as in campers and recreational vehicles. Faulty batteries can also cause significant damage to a vehicle's alternator. Vehicle electrical items not functioning correctly such as dimmed or flickering headlights and/or dash lights, slow power windows, laboured starting. The alternator/battery warning light is illuminated in the instrument cluster. The battery is dead or at a low state of charge. The vehicle does not start when commanded. The vehicle needs to be jump started. The alternator drive belt is slipping. 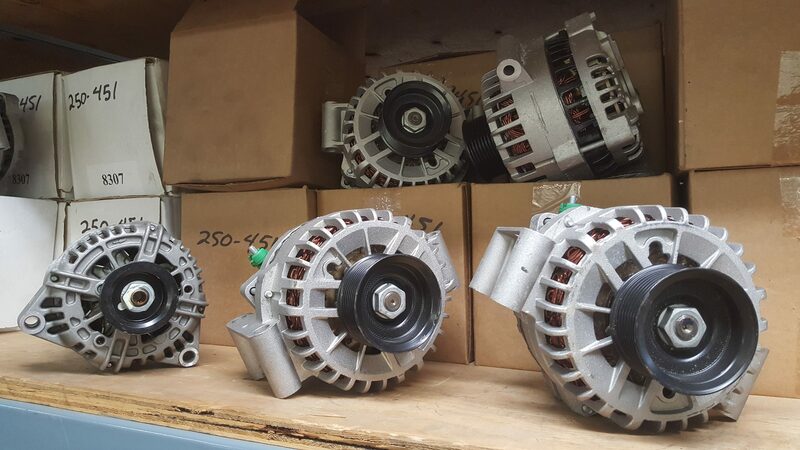 Fortunately, alternators can be rebuilt and when done with care and expertise, the rebuilt alternator function can match and even exceed the original equipment manufacturer's (OEM) specifications. Rebuilding an alternator gives the added advantages of saving money compared to a new OEM unit but more importantly it recycles metals and materials that might otherwise end up at a local landfill. First, alternators are thoroughly tested before they are disassembled. Testing can begin when the alternator is still in the vehicle or the alternator can be removed from the engine and tested on an alternator test bench. The alternator is then disassembled and individual components are tested. Components that do not pass specified values are removed from the rebuilding process and are replaced Ones which seem to no longer work are replaced. Alternator windings (rotor and stator) must also having pass a validation process. These windings can also be rewound if they do not meet specified values. Reinsulating rotors and stators that pass the testing process protects the winding for further use. Next, the alternator end frames are inspected and refininshed. The end frames can be washed, sandblasted, metal shot- peened and coated to not only give it that 'new' look but also to dress the end frame for many more years of service. Validated components and new components are then brought together for the rebuilding of the alternator. Once reassembled all alternators are tested on test benches that apply variable loads at differing running speeds. Only after passing a rigorous testing process is the rebuilt alternator ready to be placed into the operating field again.